The olfactory sense has processed odor data using a specific coding principle for hundreds of millions of years. That neural array principle for internal representation enabled instant recognition of odors by the earliest "nose brains" in lower vertebrates. An evaluation of smells enabled those primitive life forms to distinguish whether objects were threatening, consumable, or irrelevant. As life evolved, nature added more and more sensory evaluation systems and motor organs to improve the quality of decision delivery processes, culminating finally in the advanced human systems. But, even as they evolved over untold generations, the myriad intelligent subsystems of animals used the same coding principle for internal representation. The power of the olfactory sense, can be seen in the remarkable detection capabilities of dogs. The process begins with an analysis of molecules of volatile chemical compounds in the air. Across billions of nerve cells, myriad independent intelligences speak to each other through a coded internal language. Data is processed through sequences of combinatorial arrays. Such arrays can recognize and remember an infinity of finely differentiated data. Combinatorial coding was discovered for the olfactory array in 1999. Combinatorial arrays can present trillions of overlapping patterns. 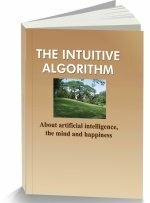 Intuition identifies patterns through a process of inhibition. Inhibition has been reported in mitral cell arrays. The brain contains a clearly differentiated hierarchy of controls. Nature developed the process over millions of years, adding functions and features, finally culminating in the human intelligence. The olfactory system identifies objects and events linked to chemical molecules in the air. The data cascades through sequences of geographically arranged arrays of neural junctions in the system. In the process, the olfactory system identifies both subtle and complex relationships in the patterns detected during varying neural firing cycles. The power of this system, which processes the olfactory sense alone, can be seen in the remarkable intuitive capabilities of dogs. The area of the olfactory epithelium in dogs is about forty times larger than in humans. The animals can detect human scent on a glass slide that has been lightly fingerprinted and left outdoors for as much as two weeks, or indoors for as long as a month. With their hunting instincts, they can also sniff the footprints of a person and identify the direction of a trail. The animal's olfactory sense connects the relative odor strength difference between footprints barely a few feet apart to sense the direction in which the person was walking. Pattern recognition of sensory data can yield such complex meanings. The olfactory process begins with an analysis of molecules of volatile chemical compounds in the air. Approximately 50 million primary sensory receptor cells in the epithelium in the roof of the two nasal cavities of the human nose evaluate the molecules. Those substances must possess certain molecular properties to enable the olfactory process. The molecules generally need to have a level of water solubility, a sufficiently high vapor pressure, low polarity, some ability to dissolve in fat, surface activity and a molecular weight below 294. The olfactory sense can distinguish among a practically infinite number of such chemical compounds at very low concentrations. Neurons encode information from sensory data into a common internal language. When particular molecules bind to receptor cells, structural changes occur within the cell. These changes generate action potentials reversing polarity across the membranes of the axons of the nerve cells. The process triggers an all or nothing output impulse, lasting about 5 milliseconds. Across billions of nerve cells, similar nerve impulses enable myriad independent intelligences to speak to each other, using a coded internal language. A computer converts physical keystrokes into binary data, which is processed using a variety of programming languages. Problem specific languages are needed to manage each task. There is no single language in which problems can be represented in computers to enable them to simultaneously handle chess, chemical analysis and banking. But, the mind fathoms the whole world through a common internal language. The olfactory sense was one of the earliest to use the unique neural code, which is central to this language. That neural code enables the senses, emotions and motor controls to interact. That code internally represents varied types of data in a single format. The code enables a conversion of molecular data into event identification data. Each type of data is represented as a combinatorial neural firing code in a geographically arranged array of cell addresses. Each address in such an array represents one element of a pattern of that particular data type. The olfactory system converts elements in the odor data array into combinatorial elements of an array representing events. The process cascades the data through a sequence of three arrays in progressive pattern recognition steps. There is a receptor array, a glomeruli array and a mitral cell array. The process begins with the receptor array, which identifies molecules in the air and ends in a mitral cell array, which identifies objects and events. The first array in the olfactory epithelium recognizes specific molecules. The array has a random arrangement of 50 million receptors, each recognizing specific groups of molecules. Recognition impulses from receptors travel to a second array of glomeruli on the olfactory bulb. Each mitral cell is activated only by one glomerulus, but is extensively linked through interneurons to other mitral cells. The glomeruli array and the mitral cell array carry combinatorial memories. The glomeruli array recognizes the activated receptors among the 50 million elements to fire patterns in its 1000 element array. That combinatorial message narrows down the molecular disposition of the odor. The mitral cell array interprets that message to output its own combinatorial message. The mitral cell message indicates to the nervous system that the breathed in molecules in the nose originate from a specific event. The memories of other arrays in the nervous system recognize that event to originate from the smell of an orange, or from the odor of spoilt meat. The mitral cell array fires the final object/event recognition combinatorial message to other intelligences in the system. The nervous system projects data from one region to another through combinatorial arrays. During their initial growth, the output axons of nerve cells grow from one region to another and “map” on to specific target regions. The cells always connect from array to array in geographically correct locations, where neighborhood relationships are strictly maintained. An olfactory neuron carries a message about odors. A nearby neuron in another array may carry a completely unrelated message. As in parallel ports in computers, combinatorial codes, with such “on/off” elements, can store a galactic mass of information. An array with just one hundred “on/off” elements can fire over 1, 000, 000, 000, 000, 000, 000, 000, 000, 000, 000, 000, 000, 000, 000, 000, 000, 000, 000, 000, 000, 000, 000, 000, 000, 000, 000, 000, 000, 000, 000, 000, 000, 000, 000, 000, 000, 000, 000, 000, 000, 000, 000, 000, 000, 000, 000, 000, 000, 000, 000, 000, 000 unique possible combinations! The human olfactory glomeruli array contains 1000 elements! Some glomeruli fire (On) on recognition of specific receptor firing combinations indicating recognition of particular molecules. Those glomeruli, which do not recognize those molecules remain inhibited (Off). On interpreting this incoming pattern from glomeruli, the mitral cell array fires. In this system, the final combinatorial message identifies an object or event. Researchers announced (Nobel Prize 2004) the use of combinatorial coding by the olfactory system in 1999. According to them, a single receptor in the olfactory epithelium can recognise several different odour molecules. When any one of these molecules hits the receptor, the nerve cell sends a signal to a specific glomerulus. They found that the same odour can be recognised by several different receptors and a glomerulus with a given receptor type responds to several different odours. Combinatorial coding carries the message. As an example, the chemical octanol was found to be recognised by a combination of four different glomeruli. As against this, octanic acid, in which the hydroxyl group of octanol is replaced by a carboxyl group, was recognised by the same four glomeruli, plus an additional four. Small molecular differences completely change the smell of a chemical. While octanol has an orangy rose-like scent, octanic acid smells like sweaty feet. Leslie Vosshall reports that, in her lab, ordinary volunteers, (not wine tasters or perfumers), could clearly distinguish between different combinations of 128 odor molecules, indicating an average human ability to differentiate between 1 trillion smells. Identification of a specific pattern in an astronomically large assembly of patterns presents a huge search problem. Combinatorial arrays can present trillions of overlapping patterns, where each pattern may have a significantly different meaning. Both octanol and octanic acid were recognized by four glomeruli, (say, A, B, C and D). Octanic acid alone was recognized by an additional four glomeruli, (say, E, F, G and H). So, if octanic acid was recognized, ABCDEFGH would fire. In the process, both octanol and octanic acid would be identified. Accurate recognition of overlapping patterns in such a large database appears a seemingly insurmountable problem. There is no known search algorithm, which can identify a single pattern from a search space containing trillions of overlapping patterns. 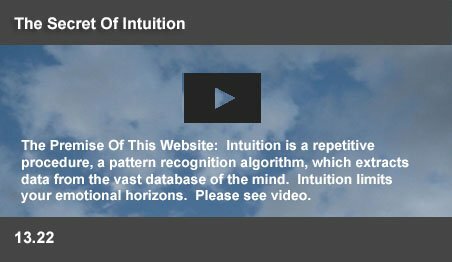 But, this website suggests that intuition is a powerful algorithm, which can instantly search large databases. The process eliminates unrecognized possibilities, using coded inhibition by nerve cells. In the octanol/octanic acid case, the firing by glomerulus G, or H would indicate that the odor does not come from octanol. The mitral cell array, which can represent millions of odors, would inhibit the “octanol” possibility. Throughout the nervous system, this process of intelligently coded inhibition, explains the secret of instant recognition. The brain is known to use inhibition for highlighting the importance of messages. If the touch of a single hair is critical information, all surrounding sensory inputs are shut off to highlight the message. Similar automatic emphasizing of contrasts takes place for both visual, auditory and sensory inputs. The precisely maintained neighborhood relationships of the projected arrays and mapped neural pathways enable such inhibition throughout the system. The brain actively participates in closing off irrelevant sensory inputs. Throughout the nervous system, the firing of a single cell is known to "shut down" millions of cells. There are neural circuits which switch off other circuits when their own areas are energized. There is evidence that the mind carries such systematic elimination beyond logic. This is illustrated in the popular vision experiment, where a drawing can be interpreted as a vase, or two faces facing each other. The mind eliminates one interpretation to recognize the other - a vase, or two faces. Evidently each recognition path acts powerfully to inhibit the other. Inhibition comes from many inputs to enable the mitral cell array to fire indicating the recognition of the smell of an orange. Lateral inhibition between mitral cells is kniown to occur through interneurons known as granule cells. The glomeruli are also permeated by dendrites from the mitral cells triggering inhibition. The output axons of the mitral cells travel through the olfactory nerve tract to many regions of the brain, including the olfactory cortex and the amygdala. These regions further interpret the data and send feedback messages. These messages can also trigger inhibition. Each mitral cell receives thousands of dendritic inputs, each representing a specific data type. A massive combinatorial memory enables each mitral cell to fire, or to become inhibited. Researchers report a significant process of inhibition in the mitral cell array. The process inhibits unrecognized elements. The array finally reports the recognition of the smell of an orange. Incoming data in the nervous system passes through hierarchies of processing arrays. At the highest level, the prefrontal array evaluates the final data. The arrays in the amygdala, the limbic system and the hypothalamus are lower level control centers, which substantially manage the system. Experimental studies of the impact of destruction of localized regions in animals point to a hierarchy of such control systems. As higher levels are included with the spinal cord below the cut off section, more effective controls are retained. With transection below the hypothalamus, minor reflex adjustments of systems survive, but are not integrated. With transection above the hypothalamus, separating it from the limbic system, effective controls are maintained within a moderate range of conditions. Innate drives and motivated behavior are preserved, including feeding, drinking, apparent satiation, and copulatory responses. But animals may attack, try to eat, drink or copulate with inappropriate objects. But if the connections between the limbic system and the hypothalamus survive and only the frontal cortex is cut off, normal homeostasis is preserved even in a wide range of adverse conditions. The array in the limbic system can emotionally manage our lives. Human level intelligence operates, often helplessly, from the prefrontal array. Francois Jacob noted an entrenched quality of evolution. “In contrast to the engineer, evolution does not produce innovations from scratch. It works on what already exists, either transforming a system to give it a new function or combining several systems to produce a more complex one.” Nature began with combinatorial coding in the olfactory sense of early “nose brains.” That coding could store massive inherited and acquired knowledge in the many self contained regions within the network. Each is an independent intelligence, which communicates with the rest of the network through this common internal representation of a particular type of data. Each one of millions of smells, emotional expressions, or motor control impulses are each represented and recognized as a pattern of firing by specific neural arrays. Each element in the array recognizes combinations and contributes to the network. Nature worked on that process over millions of years, adding functions and features, which finally culminated in the awesome wonder of human intelligence. This page was last updated on 01-Jan-2014.